5.9 isn’t just any number; it’s the magnitude of the devastating earthquake that struck the Italian region of Emilia May 29, 2012. 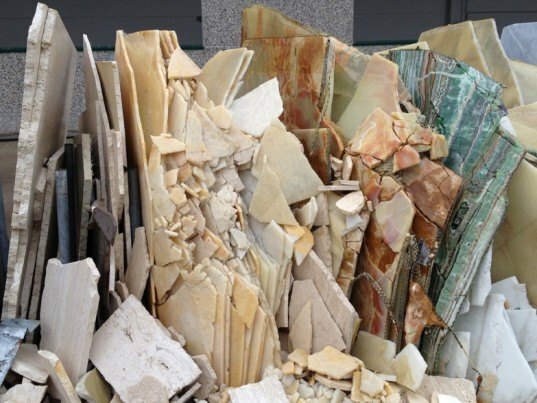 Italian company Budri was one of the companies affected by the quake, and they reacted to the event by creating a series of tables and other decor from their damaged archive of marbles and stones (including onyx, lapis lazuli, amethyst and mother of pearl). The series, aptly dubbed Earthquake 5.9, was recently presented at the 2013 Salone del Mobile. Designed by Patricia Urquiola, the collection features stunning furniture pieces (tables and small tables), home accessories (vases) and coverings in marble and onyx that are created using hundreds of fragments of “quake-stricken” slabs. Earthquake 5.9 is the perfect example of how beauty can come out of destruction, and how life can be injected back into something that has been totally destroyed. Budri and Patricia Urquiola orignally began their collaboration in 2010, when, eager to explore the great potential of the tiny off-cuts of marble, onyx and semi-precious stones lying in Budri’s recycling containers, Urquiola had the idea to create an “anti-waste” collection.